Southeastern Arizona is rich in history and natural beauty. Here is a suggested itinerary that includes sites related to Native American, Spanish, and early Anglo-European presence as well as a bit of hiking, some spelunking, and some excellent shopping opportunities. The best time to make the trip is spring or fall. Summer in Southern Arizona can be very hot and winter very chilly. Also, believe it or not, snow can limit access to some of the higher elevations in Arizona. Approaching the area from the north, east, or west, the most direct route is via the Interstate Highway system. Interstate Highway 10 connecting Tucson, Arizona, and Las Cruces, New Mexico, runs through Cochise County and skirts the northern rim of the area covered by this itinerary. Coming from the south through Mexico your best route will be via the Douglas crossing point. There are six towns in the area that can be used as bases of operation - Wilcox, Benson, Tombstone, Sierra Vista, Bisbee and Douglas. All have an ample range of tourist services. Sierra Vista is the largest, Tombstone the most famous, and Bisbee the most unique. Nearby Tucson is also a possible base for one leg of your trip if you are coming from the north or west. Make certain that you have a good road map before deciding on the specifics of your visit and check the Cochise County links below or click on the locations of interest on the map above. In addition to some beautiful desert scenery and the various communities in the region, there are nine major things to include in your itinerary - Karchner Caverns, Fort Huachuca, Coronado National Monument, Slaughter Ranch, Bisbee Copper Mine, Cochise Stronghold, Chiricahua National Monument, Fort Bowie, and Apache Pass. Depending on how you like to travel, the trip should take about three days if you want to see it all, but it can be done in two days if you are willing to save a few places for a later visit. Two Day Trip, Day One: depart from Tucson proceed east on Interstate Highway 40 to Highway 90. Turn south on Highway 90 and proceed to the Karchner Caverns State Park. (Advance reservations are required for the best tours. Telephone ahead.) After a morning tour, the park is an excellent spot for a picnic (don't forget to bring lunch with you). After lunch continue south to Fort Huachuca located west of Sierra Vista (follow the signs). Fort Huachuca was the home of the famous Buffalo Soldiers and has a proud history dating back to the Apache wars of the nineteenth century. (The historic fort is located on an active military facility and consequently you will need your driver's license, vehicle registration, and proof of insurance to get a pass for entry into the fort.) If you did not picnic at the caverns there are plenty of places in Sierra Vista to eat. After visiting the fort continue south on Highway 92 for a brief visit to Coronado National Monument. After paying homage to Coronado return to Highway 92 and proceed to Bisbee. Bisbee is the home of a very large copper mine and is an excellent spot for a bit of shopping, dinner, and overnight in one of several delightful inns. If you like beer Dave's Electric is an excellent local brew. Two Day Trip, Day Two: after breakfast and a visit to the Mining Museum in Bisbee proceed north on Highway 80 to Tombstone for a morning with the memories of the Earps and the Clantons and a visit to the Tombstone Courthouse. Have lunch in Tombstone. After lunch ask directions and take the back road east to Highway 191. Turn north on Highway 191 to Highway 181. Turn east on Highway 181 and follow it first east and then north to the Chiricahua National Monument. There are a couple of good hikes in the park and some fabulous scenery. These were the rocks that sheltered Cochise, Geronimo and their Apache breatheren. If you decided against lunch in Tombstone this would be an excellent place for a late picnic lunch. (Don't forget to bring lunch with you.) After Chiricahua turn north on Highway 186 and follow the signs to Fort Bowie and Apache Pass. The road off of Highway 186 is dirt and the foot trail to the fort is about a mile and a half. (Once again heavy rain may make the road impassable for some vehicles.) After visiting the fort continue north on Highway 186 to Wilcox. Overnight in Wilcox. I like the Barbecue spot in the old part of town. Straight forward barbecued meat served with potato salad and beans in an old railroad car near city hall (which is in the railraod station.) Modest price. Modifications of the Two Day trip are of course yours to make. Everybody is obviously not interested in the same things. 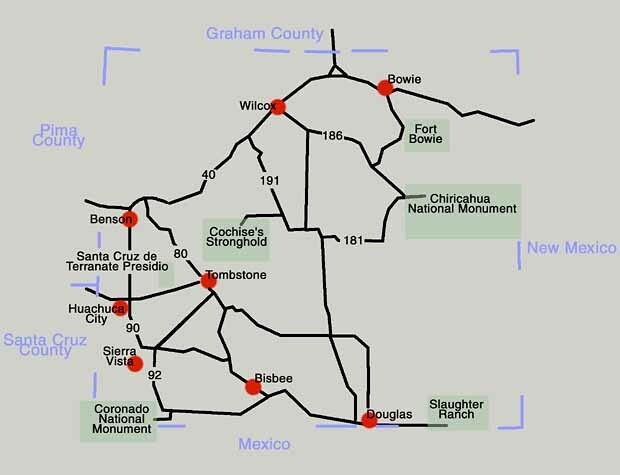 One could easily cut out Coronado National Monument and Fort Huachuca and visit Tombstone on the afternoon of Day One, going on to Bisbee that night. This would make it possible to fit in the Slaughter Ranch the morning of Day Two prior to continuing on to Chiricahua National Monument that afternoon. Lunch could be in Douglas that day if you don't want to picnic in the park. For me the critical elements of the trip would include Karchner Caverns, Tombstone, Bisbee, Chiricahua National Monument and Fort Bowie. This itinerary is basically circular and can easily be modified for those approaching from the south or east. If one has the time I recommend taking three days for this itinerary. The first day would mirror Day One of the Two Day Trip and would overnight in Bisbee, but instead of one night I would arrange to stay in Bisbee two nights. Day Two of the Three Day trip would start out with a morning visit to Tombstone followed by a stop at the Slaughter Ranch east of Douglas and a return to Bisbee for dinner and overnight. Day Three of the Three Day trip would add a visit to the Cochise Stronghold (off of Highway 191 just north of the turnoff to Highway 181) prior to continuing on to Chiricahua National Monument and the rest of the Two Day, Day Two itinerary. No matter which way you proceed and no matter which destinations you include I am certain that you will find this trip enjoyable and worthwhile. It offers a wide variety of destinations and activities and should be interesting to people of all ages.